One of Rabbi Berel Wein's finest works, this innovative commentary on Pirkei Avos/Ethics of the Fathers belongs in every Jewish home. With an astute eye ever fixed on the complete traditional text, Rabbi Wein explains and interprets its contents in terms relevant to today's Jews. Revealing great insight into human behavior and replete with illuminating anecdotes, the work applies the words of the Sages to current Jewish experience. Did the Sages write Pirkei Avos specifically for our times? Rabbi Wein makes it appear so - for in his talented hands, the deep meanings of the text shine with new radiance. A noted historian, Rabbi Wein liberally punctuates his commentary with enlightening historical references and demonstrates his firm understanding of our era. The lessons of the Sages are enhanced by explanations of their original context, yet they seem to glide right into the twenty-first century. 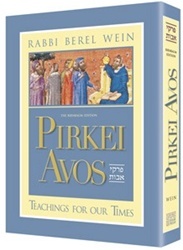 Pirkei Avos offers guidelines for successful living and the values it teaches are timeless. Secure in Rabbi Wein's scholarship, inspired by his meaningful examples (and even amused by touches of the rabbi's legendary wry humor), every reader will treasure this contemporary reading of one of Judaism's classics.